Purrfect Pair is a sweet kitty set for all those cat lovers out there and their sweethearts! This set also includes some warm and fuzzy sentiments. Here is a quick card I whipped up. 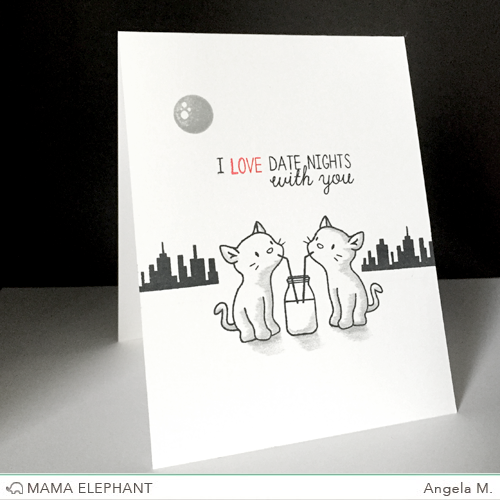 I always love a sappy love story and what is sweeter than two kitties sipping milk under the moonlight? I also grabbed the city image from Believe in Magic and the Moon from Winter Wonderland to make this sweet scene. Kryssi made a similar card with a totally different feel, except they're sharing a sweet hot bowl of yummy noodles, lol! She used the Happy Script creative cuts that will be released this month as well. Totally smitten with the sweet sentiments in this set, you? I love kitties...cute cute cards. Love it! It's on the top of my list! Love kittens and I have to have it! ah, I just love this wonderful kittys! Definitely on my wish list! Lady & the Tramp revisited...both are just darling. Can't wait to see the set. Oh, these are just way too sweet!!! Love! oh my goodness. this is RIDICULOUSLY adorable!!! Purrfect stamps and card for all the cat lovers. These kitties are totally adorable!!! Love them! I don't even like cats, but THESE are adorable. Nice job, ladies!!! That is so cute. The kitties are adorable and I need that Happy Script die!